Meeting at the Masonic Hall, Church Street, Wincanton BA9 9AA. 18.30 On the third Thursday of January, April, September and November (Installation). The Lodge has 29 subscribing members. Provincial officers Active and promotion. The Lodge was presented with the Traveling Keystone brought to the Wincanton by members of the Hallam Lodge No.730. Four members traveling together nearly did not make the meeting because the car in which they were traveling had 4 SATNAV’s working at once and took them all around the county before arriving a tad late at Wincanton. Those attending the meeting were given a demonstration of the Advancement ceremony (Wincanton Style). A goodly meeting was enjoyed by one and all. Pictured l to r John Massey, Bob Cole, Andy Grey, Derek Bromwich, Alan Douglas, Neil Hawes PGJW, Derek Wilton, Mike Waterman WM, Richard Old, Tony Wilcox PGSW and Chris White. The members of Science Lodge took the Traveling Keystone to the Cerdic Lodge on the 16th February. W.Bro Max Foote made an excellent job of installing his successor, Mike Waterman in the Chair. Those of us who know the temple at Wincanton realise it is not the largest but on this occasion it was packed. 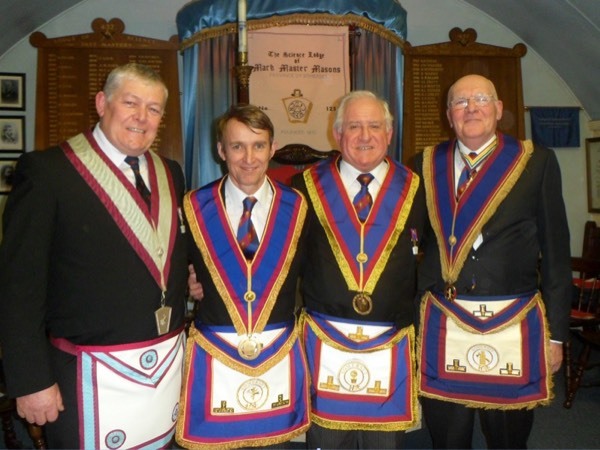 Nearly sixty brethren were present when Mike Waterman became Master of the Lodge. It was a splendid evening, Deputy PGM Ray Guthrie commented how good it was to see so many brethren present including the Provincial Senior and Junior Wardens, Tony Wilcox and Neil Hawes and no less than 9 Grand Officers. One of the highlights of the ceremony was an excellent presentation of the working tools by Bro Paul Meron, the Lodge Junior Overseer. The ceremony was conducted with dignity and was a pleasure to witness. The festive board afterwards was pleasant and good humoured, with some very good toasts, although not many understood the Junior Wardens joke in his toast to the visitors! Great Mark fellowship was the order of the day! A new but very experienced team at the top, Senior Warden - Steve Defries, Master - Mike Waterman and Junior Warden - Richard Old. 16th April 2017 100th Birthday celebrations for W.Brother Jim Allen. 19th November 2009 New Master, Max Foote takes over.